Aunt Mary sez: "More photos please!" We'll do our best. This is Croker Island. Lots of blueberries! My colleague Jill at WPSU started a pool when I left town--"How many days on the boat till Cynthia tears her hair out and runs home screaming?" Place your bets now. Meanwhile, my colleague Emily has started a SECOND pool: "How many times on this trip will Bill go swimming in the name of boat safety?" The score so far: FIVE. He's gone into the drink once with a large mallet (to restore a propeller that was slipping out of place) and four times to remove water weeds from the prop. To those five swims, now add to the count the three times he's stripped off his shirt and dived into the drink as part of our adventures in anchoring. 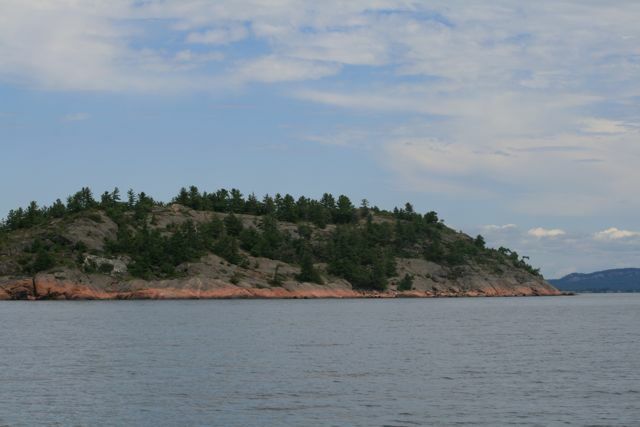 In the North Channel of Lake Huron, many coves are ringed with sheer rock walls that plunge into deep water, so you can anchor very close to shore. It's common to tie up "Mediterranean style," which means, drop an anchor from the bow and tie the stern to a tree. 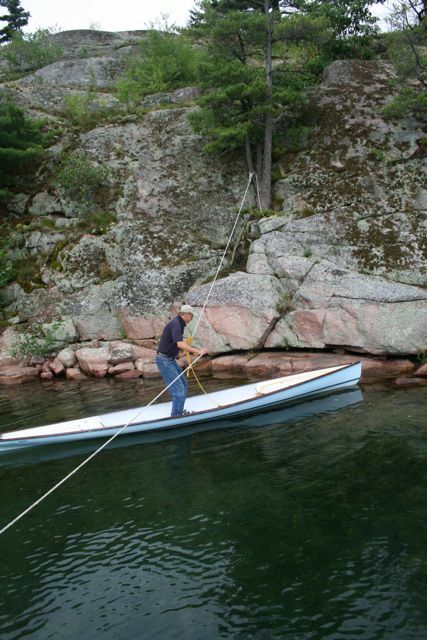 Most people use their dinghy to get to shore to make the tree tie-up. That's an option for us, of course (though it takes 15 minutes to install the stretchers that support the oars in our dinghy.) But swimming for shore is more direct. We spent last night on Croker Island, one of a cluster of islands collectively called "The Benajmins." 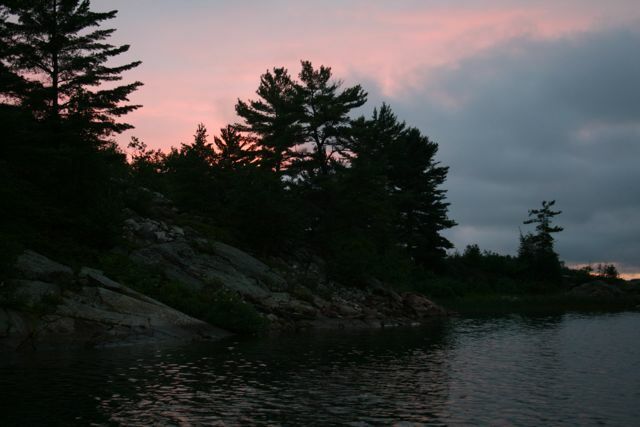 Just before sunset we crossed to the shore (in the dinghy, not swimming, but using a canoe paddle instead of the oars) and scrambled up the mounds of pink granite draped with cushiony mats of blue-green lichen and clumps of low-bush blueberry to the bare summit. Then we sat, and listened. Fifteen years ago, when I was with the Cornell Lab of Ornithology, I took the Lab's "Birdsong Recording Course" (my first, pre-radio introduction to recording technology). We spent a week in California's Sierra Nevadas, scrambling around on steep mountain slopes with our 22-pound, reel-to-reel Nagra recorders. One thing that the course instructor, Greg Budney constantly impressed on us was just how rare it is, in modern times, to find yourself in a location when the only thing you can hear is the natural world. No far-off whine of car tires, no drone of a passing jet, just birdsong (and wind, and water, and frogs, and coyotes . . . the sounds you would have heard if you could magically be transported back in time, 500 years, before European settlement of the continent). That's what we heard from the summit of Little Croker: A white-throated sparrow trilling, "Old Sam Peabody!" A couple of herring gulls squabbling. A common loon, saluting its mate. As we meet experienced boaters on this trip, I've had to admit, more than once, that we are novices, and that everything we know about boating (navigation, docking, anchoring, using a VHF radio, the list goes on) is mere book learnin'. We read a book, so we understand the task intellectually, but we never actually DID it before. And as the trip goes on, we learn all kinds of cool stuff. 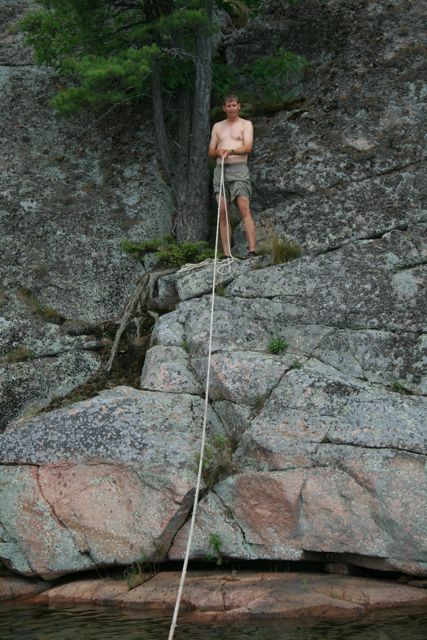 Like, once you have swum across the gap to tie a stern line to a tree, you don't HAVE to swim back to retrieve it. 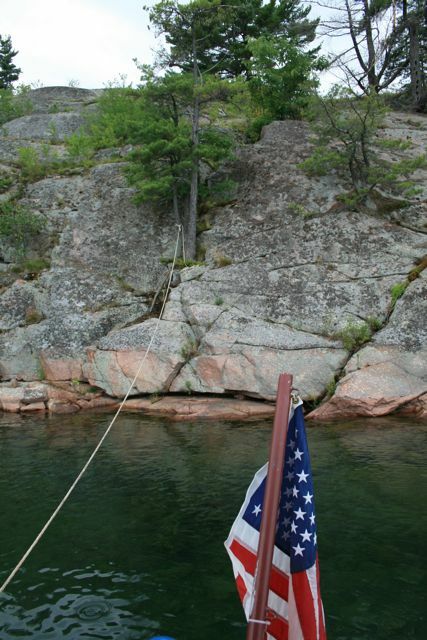 We watched a young boy from the sailboat anchored farther down the cove drop lightly into his Zodiac-style dinghy and zoom, hand-over-hand, along the anchor line to shore. 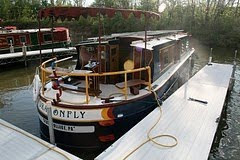 Just like an old-fashioned rope ferry! So when we weighed anchor, on a cold and cloudy morning, there was no swimming required. If you made your bet that "Bill goes swimming" nine times total, well, sorry . . . not yet!